We offer anonymous FTP uploads for our customer's convenience. Please note that once you upload the files to our server they will not be visible to you. This is done to protect your privacy. Locate the artwork files you want to upload on your local system (your Hard Drive, CD-ROM, ZIP Disc etc..). ZIP or STUFF all the files using a FREE compression utility like WINZIP or STUFFIT. Please include ALL used fonts, images, and related files. Send only a single ZIP or STUFFIT archive. Remember where this archive is located on your Hard Drive. 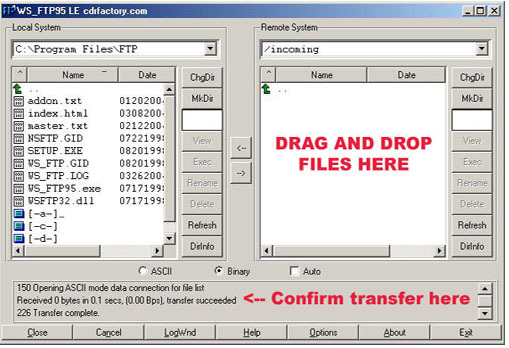 Download a FREE FTP client/program to access our FTP server. Two easy to use programs are listed below. Enter the following info into the FTP software exactly as it appears below. *Only upload individual files or ZIP/STUFFIT archives. Click the "incoming" folder icon on the right most pane of the FTP program. *Only upload individual files/ZIP archives. Drag and drop the ZIP or STUFFIT archive containing your artwork files into the "Incoming" folder located on the right-side window. Below is a photo indicating where to drag and drop the files. Wait for the files to upload completely. CONFIRM UPLOAD BY LOOKING IN THE STATUS WINDOW ON THE LOWER LEFT OF THE WINDOW. It should say transfer successful. *For your PRIVACY ALL FILES YOU UPLOAD WILL BE HIDDEN TO YOU. Confirm your upload by e-mailing kyricco@aol.com with the file name you uploaded, your name, telephone number, and project title.